nice owner . Relaxed selling experience. JBF is a great way to make a little extra money for those weekend getaways. Very organized and clean. Owner is very friendly! Everything was well organized and I was able to make a little extra money without the hassle of trying to sell online. Two young children get to have varied wardrobes including lots of dress up for a very moderate budget. Lots of toys and equipment at a price that makes it easy to indulge. 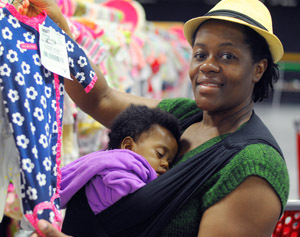 A way to convert outgrown clothing toys and equipment into new clothing. Friendly people and clean bright venues. I love the real-time sales reports- they’re addictive! The great prices and getting money for stuff I am no longer using! I like the way things are very organized for drop off and pick up. "I love that I can get such incredible deals and also find unique items. Between selling and buying, I usually come out even or ahead. " "Besides the great deals we get at this event, I’d say the staff and volunteers not only do a great job at setting up everything, they are all have great customer service. " The new owner is great and making great changes. Can’t wait for the next sale! I earn money for my family while still being able to stay home with my kids! "Everything! If I buy something that doesn't work out, I can sell it the next time!" I love that feeling I get knowing I'm not just dumping off hundreds of dollars worth of stuff for someone else to sell & profit from. I'm getting some of my hard earned money back! I loved doing the valet consigning this time. It really paid off and was easy. "The friendliness of my check-in person. The ease of parking. The availability of carts for unloading. The space for my items. The times available for dropping and shopping. Really, the whole experience. WAY better than when I sold at West Allis State Fair Park! " Everyone there is so friendly and helpful! Drop off and pick up was Amazing.. I will DEFINITELY be back for the Fall/Winter Sale..
"Pretty well organized, just wish people wouldn’t use scented detergent. " The chance to recycle and get some money for perfectly good things. Also the chance to buy new stuff for such amazing prices! The ability to sell the clothes my kids have grown out of and get new clothes for their growing bodies. It is super easy to do! It was my first time and had no problem. "I love the concept of pop up sales in general and the values of supporting local families with affordable, gently-used items. This particular sale has a fantastic venue. The church environment is comfortable, plenty of parking, excellent bathrooms, comfortable couches to nurse my infant, and coffee and snacks! The ME Life photographer booth is a primary reason I keep coming to THIS sale. " "The owner, Charla is so kind and wonderful. She cares about the community and the impact of giving. JBF is great for everyone involved. I love that families can sell their items and new families can get a great deal. The donations to community charities are amazing and so needed!" So organized! Always a successful sale and payment is quick! I loved how friendly the volunteers were and well run the event was. "The staff is very approachable and helpful. It’s a way to get rid of a lot things in a short time period that others can use. I like the option of donating unsold items. I didn’t have anything to bring home after the sale, and the organization benefits by being able to sell or pass along any unsold items. " "Being able to clear out the closets and drawers of things we are no longer using and actually make some money as a reward!!! We are also able to recycle between all of the participating JBF families, friends and visitors, preventing massive amounts of gently used clothing, household goods, baby and sports equipment and toys from being thrown into landfills. We are saving our homes from clutter, saving our budgets from the high costs of retail purchases, and saving our planet by passing along our no longer needed items to those who need them instead." So much to choose from and most items are in good condition. Also the venue was plenty big and I never felt crowded by people. "I love that I can get a return on lightly used, great condition clothing for my grandkids. It's like having a garage sale without having to actually man and set-up for one -- HUGE benefit for me! Of course, being able to buy GOOD condition clothing/items for them at reasonable prices when they won't be wearing/using them for very long is wonderful for my ""Grandma envelope""!" I received some great deals on clothes for my Grandchildren. 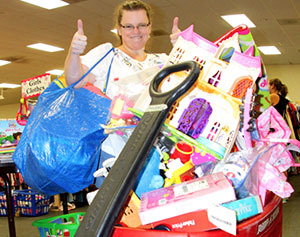 "I love the way I was able to clean out all of the toys, make a little money and donate to children in need. It was very easy to do. This was my second time I have participated. Thanks for such a great organization." Everything is very easy to find when dropping off. Seasonal rules aren't too restrictive as other areas are. I LOVE being able to find clothes for my kids that are in great condition and at such affordable prices! Half off days are GREAT! Making money on items I have around my home and being able to buy my kids new sizes for a great deal. It's so easy and set up well. It's so organized. Love all the great deals and wonderful selection! Always so much to choose from. I look forward to going twice a year to the Puyallup location. "I would absolutely recommend JBF to anyone and everyone that I think Will appreciate it.I just love it so much. I wish I had learned of it sooner! It’s super organized and just all around amazing!" Sale was amazing this time around! I sold a lot and was able to get a great deal on full summer wardrobes for my kids.